James Mwenda with Sudan. 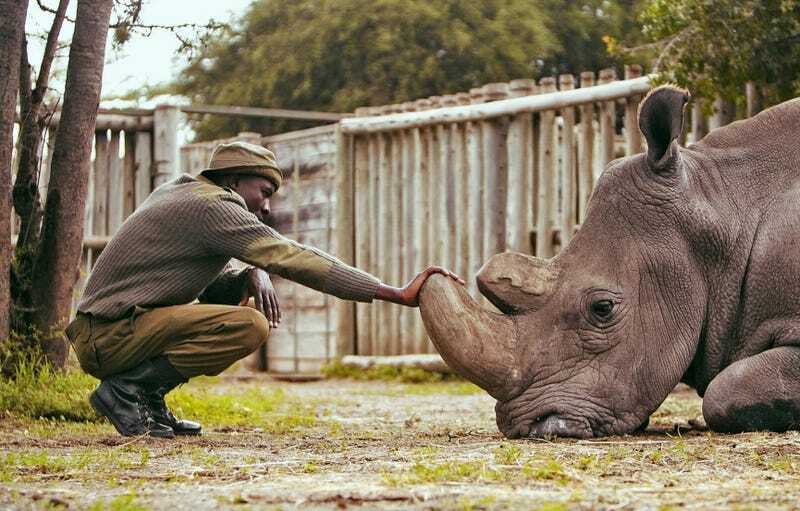 The last remaining male northern white rhino died in 2018 aged 45. Mwenda promised he would be his friend's "voice around the world". DERBY, ENGLAND—James Mwenda has a front row seat to the spectacle that is the human-driven extinction crisis. Day after day he checks on, feeds, cares for, and often just hangs out with, the last two remaining northern white rhinos on the planet. It was a packed trip. When Earther met up with Mwenda earlier this week—in the lobby of a motel near Derbyshire’s cricket ground—he was preparing for a series of meetings and presentations. The days before had involved educational appearances at schools as well as an appearance on national television, and the event was culminating Thursday night with a fund and awareness-raising talk at London’s prestigious Royal Geographical Society. “It’s really hard work out there on the ground, protecting the animals, it’s more like a war,” Mwenda told Earther. The enemy in that war? The incessant demand for rhino horn, chiefly from Asia, that has eliminated the northern white from its native habitat in central Africa while decimating black rhino populations and placing constant pressure on the southern white. Fatu and Najin, along with the males Sudan and Suni (who died of natural causes in 2014) were relocated to their spacious home in Kenya from a Czech zoo in 2009. Mwenda spends so much time with the two surviving females that he refers to them as “his girls” and some people joke Fatu is actually his girlfriend. He feels a “great responsibility” in caring for them, he said. Mwenda is also one of a number of trained rangers monitoring and protecting rhinos across the wider Ol Pejeta reserve, which covers 90,000 acres and is home to the largest black rhino population in eastern Africa. He believes Kenya has been doing “slightly better” in terms of the number of rhinos it has been losing to poachers compared with countries such as South Africa, where an around 2 rhinos a day may be lost (albeit with a larger number resident). He ascribes that to an improved awareness. Mwenda now hopes the northern whites can be saved by science. Scientists from Germany, the US, the Czech Republic and elsewhere are hoping to use harvested eggs and tissue cultures, as well as sperm frozen from a number of males, to revive the subspecies. But this is a hugely expensive undertaking and one with no guarantees. It is estimated that a pure northern white calf born to a southern white surrogate mother could be the best part of a decade away.